Straight from market to Cobb - fresh tuna steaks & asparagus - delicious! We call the Cobb our 'barbecue', but as often as we have delicious 'barbecue' type meals from it calling it a barbecue belies its full potential and value. It really is a versatile multi-purpose cooking implement. 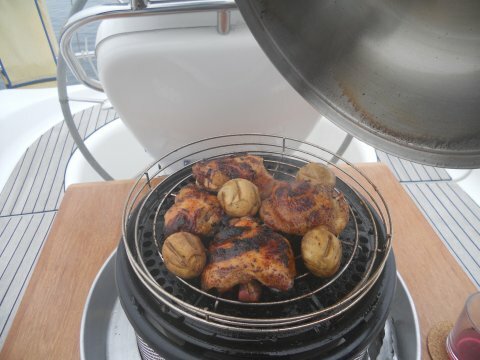 Our cooker aboard Pipit is adequate, but it does have only two burners, no grill and a small oven without thermostatic control. 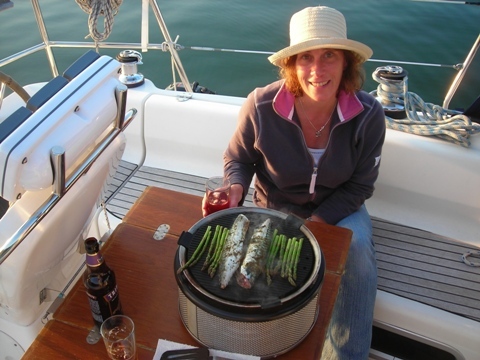 For anything we would griddle or roast in the oven, the Cobb gives far superior results, and using the frying dish for paellas, clams or mussels gives equally good results without the heat or smells lingering below decks. We haven't yet tried smoking food in the Cobb, nor have we filled the moat with wine to add flavoured steam, so there are more culinary experiments to do. 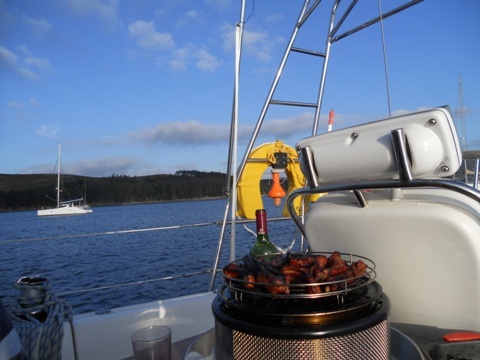 Keeping the heat out of the galley also allows us to enjoy the fantastic views in the Ria de Camarinas over a bottle of Spanish red as our dinner of sticky pork spare ribs cook. Perfect crackling on a pork joint. 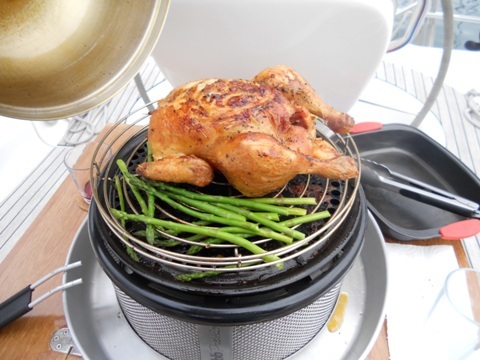 Of the Cobb accessories available, we have the standard grill plate plus the roasting rack, non-stick griddle and frying dish. The newer model of the roasting rack which we bought has a fiddle rail to stop food rolling off. Nothing worse than an escapee sausage... We use the grill plate with the rack to roast joints of pork, beef, whole small chickens, duck breasts, chicken pieces, sausages, thick chops and vegetables. We have even used the Cobb to cook the major components of two Christmas lunches - rolled stuffed turkey breast wrapped in foil on the roasting rack, potatoes roasted in the moat, with Pipit's cooker free to roast parsnips and other vegetables in the oven and sprouts and other veg on the stove top. 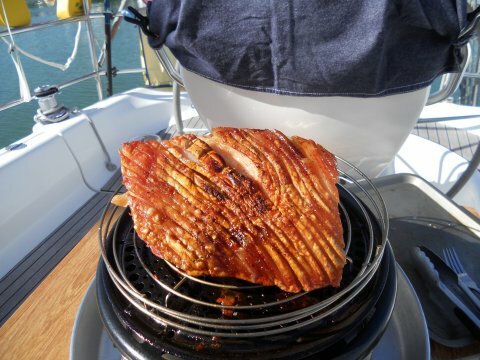 The roasting rack keeps the food close enough to the heat to cook and brown it beautifully with crispy skin where appropriate, but prevents it from burning as it may if put directly on the grill plate. Although you can cook directly on the grill plate, we find that using the roasting rack, even for things like thick pork chops gives better results. 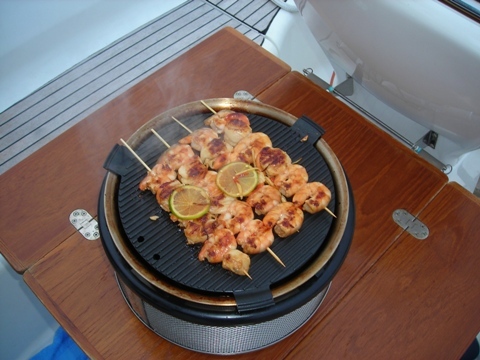 The non-stick griddle is perfect for fish, prawns, scallops, thin chops, steaks and vegetables. This results in perfectly crispy skin on fish, beautifully browned meat or delectable griddled vegetables with everything remaining juicy, tender and full of flavour and of course giving that classic caramelised griddle pattern. 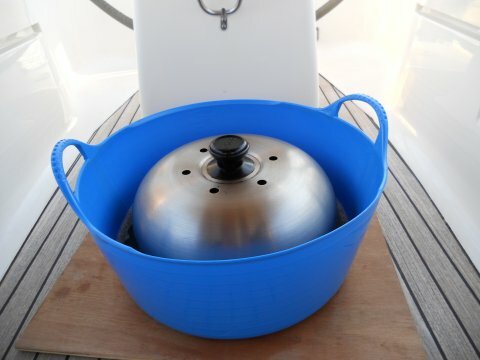 The frying dish is ideal for clams, mussels and paella. It takes a while to really heat up, but to be fair, it is a very large pan. 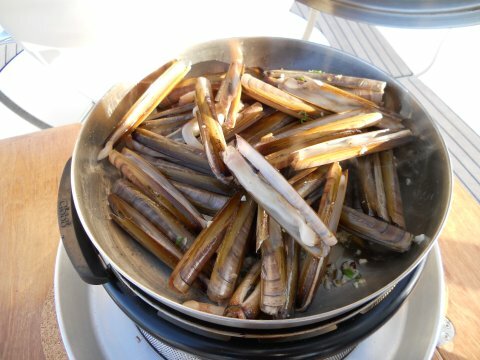 The frying dish works well to cook clams (delicious Galician razor clams in this case) and mussels as well as paellas - remember to let the pan heat up well first and keep the lid on to retain the heat. 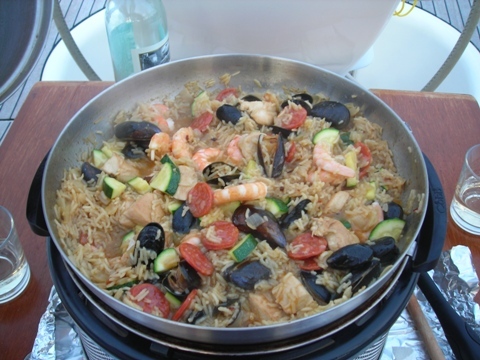 Paella in the frying dish - mussels and prawns fresh from the market in Saint Vaast (Normandy). The non-stick griddle gives superb results with prawns and scallops. 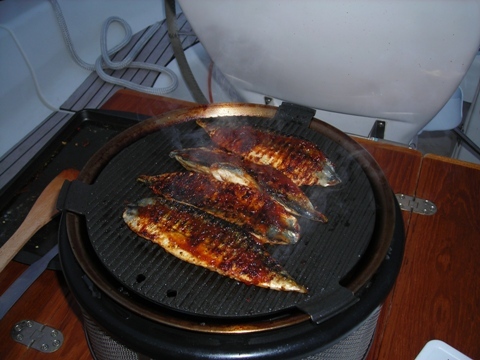 Fish cooked on the non-stick griddle is also fabulous - crispy skin and succulent flesh. The grill plate with the roasting rack fitted, note the fiddle on the rack - chicken pieces with lusciously crispy skin and juicy mushrooms here. You can fit a whole (small) chicken on the roasting rack, but for larger birds (!) you can get a dome extension. Just a tip, if you are interested in one of these, don't google dome extension for larger birds... We start cooking with the skin/crackling side down on roasts, chicken, etc, then turn once the skin/crackling has crisped nicely. 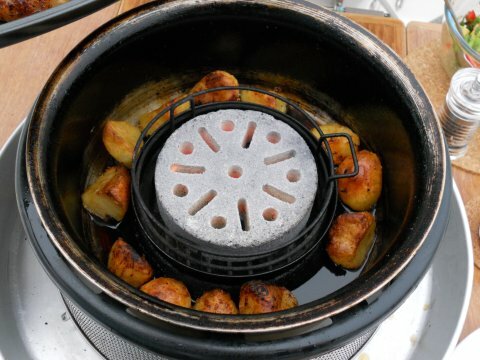 Roasting potatoes is easy with the Cobb. Par-boiled, just like you'd do them for oven roasting, they cook in the fat which gathers in the moat. Sweet potato, pumpkin and butternut squash work equally well. The potatoes need to be of a size, or cut to a size to fit neatly in the moat. At this size, they take 30-45 minutes (par-boil for a few minutes first, a bit less time for sweet potato, pumpkin or squash), so you need to time the cooking of the other food to suit. If the meat or poultry we have to cook will take only a similar time, we add a bit of olive oil (or even better ground nut oil as it has a higher smoking temperature) to the moat (allowing the oil to heat up for 5 minutes before adding the potatoes) as the fat from the meat or poultry won't have dripped into the moat yet. Cobb roast potatoes are absolutely delicious. 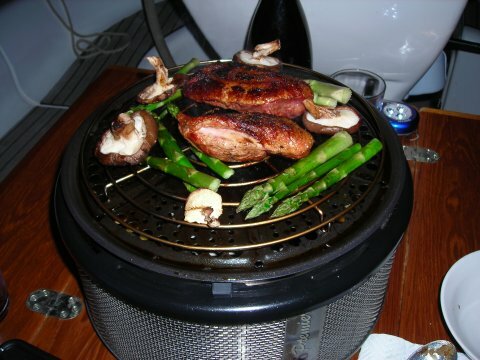 Duck breasts, asparagus, mushrooms and roast potatoes in the moat - one of our earliest Cobb triumphs! We burn Cobblestones which we buy in bulk (and as Tim, who kindly collected our last carton from the Boat Show will attest, bulk is the right word, as they are heavy, well certainly a carton of 36 is!). They work extremely well, with just a bit of flame for the first couple of minutes until the whole stone turns white hot. The big bonus though, is after that you just put your chosen cooking surface on, wait another couple of minutes for that to heat, and it really is ready to start cooking on! The non-Cobb 'accessories' we have include a piece of plywood (actually a cupboard shelf 'deliberately' cut short...), upon which we rest the lid when turning food, adding potatoes into the moat for roasting, etc (Cobb now sell a bamboo board with a rebated channel for the lip of the lid which would also work well). 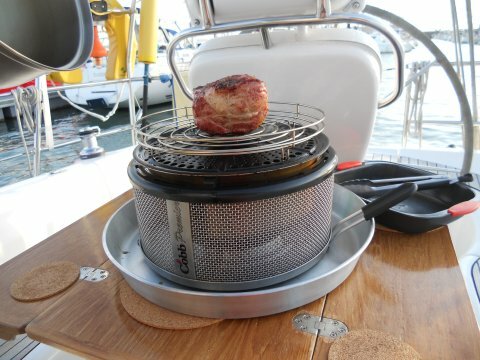 The design of the Cobb is such that the bottom does not get hot, so it can be used, as we did initially, right on the cockpit table. We've found, however, that when you remove the lid to turn food or lift the plate to add potatoes to the moat, you may get cooking fats and juices spattering around a bit. 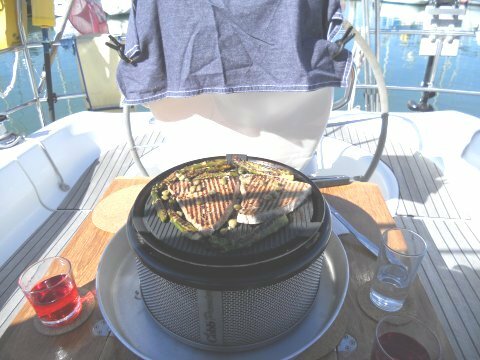 To solve that, we have a large aluminium tray (like pub beer garden trays) on which we sit the Cobb. The final useful addition is the half height flexible builders' type bucket, which is the perfect size for cleaning the Cobb (we found these buckets in two sizes, one fits and one doesn't, so measure before you buy!). Aluminium tray catches fat splashes. 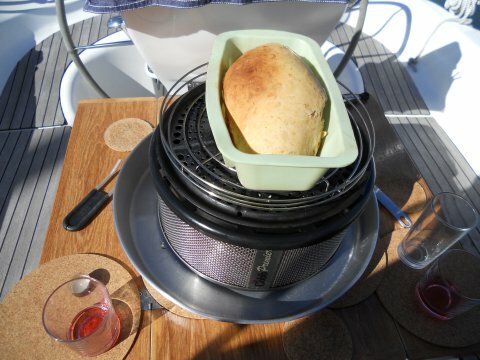 Following a recommendation by Ilona from Calluna, we tried baking bread on the Cobb for the first time after cooking some tuna steaks the week we arrived in Lagos. Ilona said she puts the bread in a silicone pan straight onto the rack, though she now uses Ecobrasa briquettes instead of Cobblestones as she found the Cobblestones burn so hot, the bottom of the bread would burn. I haven't made bread for a couple of years, but my first effort, a white loaf with herbs and sun-dried tomatoes, was quite tasty although burnt on the bottom as predicted! The silicone bread pan got a bit discoloured, but shows no other signs of damage, so I'm looking forward to baking some more fresh bread any time we use the Cobb for cooking things like fish, which doesn't take long and leaves enough remaining cooking time to bake the bread. I might try to find a round silicone pan for the bread (also recommended by Ilona) to bake it more like a cottage loaf instead of a traditional brick loaf, which may result in less of a burnt bottom as it should cook more quickly. My first attempt at bread on the Cobb - not perfect but tasty! It seems that Cobb are constantly improving and developing their product and range. As mentioned above, the roasting rack has been improved with the addition of the fiddle rail, and when we ordered a new non-stick griddle, found the design of that had also been improved with flanges underneath the griddle to locate it into the bowl, and the lid now sits right over the griddle instead of balancing on flanges on the top of the griddle. So, in summary, we can highly recommend the Cobb - relax, enjoy the view over a beer, a glass of wine or a local tipple and let the tantalising aromas whet your appetite whilst the Cobb works its magic on your dinner! Cornish mackerel and a local brew of Tribute - a perfect Cobb evening.